I have been spending a lot of time in Chattanooga lately, for obvious reasons. Chattanooga is just fabulous. It's a mix between Murfreesboro and Nashville--- smaller than Nashville, but bigger and more artsy/outdoorsy than Murfreesboro. I love exploring and finding new places in any city I am in and Chattanooga has a smorgasbord of exciting and artsy new places to discover. After seeing Jen from The Good Fortune Soap Company on News Channel 9, I knew I had to check out her store. Good Fortune makes soaps, body sprays, mineral scrubs, essential oils and many other exciting body products. I have always been a sucker for soaps and other products. Before I ventured into the store, I was at the shop working and discussing with our friend, Nathan, that I needed to leave by a certain time to get to the soap store before they closed. This prompted a fun conversation about his fascination that a local store is full completely of soap and like products. (Guys. Smh.) From then on, the phrase "The soap store" has just stuck and I have been referring to it as that every since. Once I made my way into the soap store, I was so impressed. I went specifically because she mentioned on the news clip that she can match scents. I have a perfume I bought a little over a year ago that I love so much. People always comment on how great it smells. I just love it! To my dissatisfaction, I recently found out that it is no longer being made :( I was searched the web high and low and can not seem to find any anywhere. I had just a smidge left and took it in to Jen at The Soap Store. She sniffed it and within a minute she held me three bottles of essential oils and said "hold these three together and smell them at the same time." It smelt exactly like my beloved scent. To say that I was impressed would be a major understatement. Everyone was probably sick of me by the end of the weekend because it's all that I talked about. I kept sniffing it and talking about how much I loved it. Jen wrote down the formula for the scent and I fully plan on going back as soon as I can and getting more products. 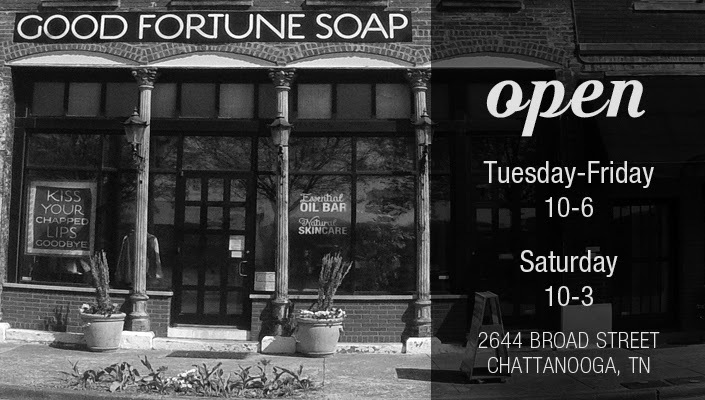 If you are ever in Chatt, be sure to stop in and check it out! * right now she has a special going on her website that if you sign up for the newsletter, you get $5 off of a $10 purchase. Cha ching!